My name is Alexis Kaplan. I was born and raised in New York City, but I call myself a Floridian for the past 7 years. Throughout my entire life, I have always had a passion for design and make-up with an appreciation for the highest quality of perfection. To that end, I have worked hard to learn and understand the skill of microblading and now I am ready to share my talent with you. I am nationally trained and have acquired all certifications and licensures to ensure you have the safest and most exceptional experience. My number one goal is to exceed all your expectations and give you the most beautiful brows you could ever imagine. I myself have gone through the procedure and now I am ready to share that joy with you. Microblading is a relatively new, manual method of cosmetic tattooing specifically for eyebrows. It is performed using a very fine sterile hand tool to deposit pigments into the epidermis. The hair strokes appear crisp, very fine, and extremely natural. Initially, the brows appear darker, but fade significantly over the healing period. A Touch-Up is performed 6-8 weeks after the initial service to perfect the shape and pigment selection. The lasting results vary greatly from person to person. However, we recommend a Touch-Up annually to retain the shape and saturation of pigment. This video features Alexis of Elite brows and Beauty featuring the latest and hottest new beauty trend, Microblading! Microblading is a 3-D tatoo that creates a semi- permanent eyebrow. Your new brows will last 8-12 months, depending on your skin type. This process is done in one full visit as well as a second, follow up. There is very little pain and no pain after the procedure! Recovery time ranges fully from 10 days to 2 weeks. 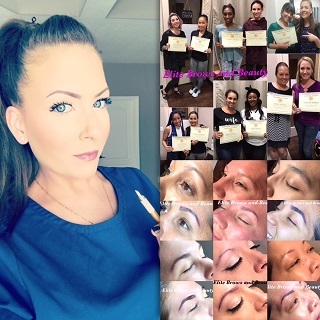 To contact Alexis directly, you can find her on Instagram and Facebook at Elite Brows and Beauty, www.elitebrowsandbeauty.com or call 407-917-0995. Alexis pays extreme attention to detail and follows the stictest of health code protocols. Unfortunately, microblading is only mildly regulated as it is such a new procedure. When choosing a professional, its important to know their background, see their work and reviews and know where their products and ink are made. Alexis has done an efficient and well rounded job of showing her work and proper protocols. Come take a tour of my website and find out more about how you can effortlessly look your best anytime, anywhere. Thank you so much for visiting my site today. If you would like to speak with me directly, I am always available by phone at 407-917-0995. I look forward to hearing from you soon.